Take your shine to the matte. In your corner: the ultimate, acne-fighting, mattifying lotion. This powerfully natural, botanically effective, oil-free formula keeps shine at bay while it weightlessly hydrates skin. Formulated with Salicylic Acid and naturally-derived Willow Bark Extract, zits are down for the count and you'll see a visibly clearer complexion. Never tight, never oily, skin is smooth, fresh and prepped for your day (or night!). ©2012 The Hain Celestial Group, Inc. Directions Apply to freshly cleansed face morning and evening. 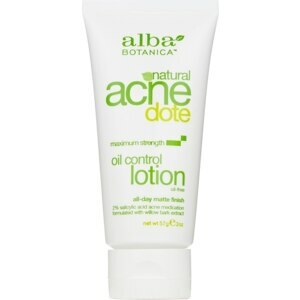 For best results, use after Alba Botanica Natural ACNEdote Deep Clean Astringent.